Chad Steven Henne (/ˈhɛni/; born July 2, 1985) is an American football quarterback for the Kansas City Chiefs of the National Football League (NFL). He attended the University of Michigan. While attending, Henne became the second all time true freshman starting quarterback in Michigan history; accumulated a total of 32 wins in regular season play, 8,740 offensive yards, and 87 touchdowns; and in his senior season, led the Wolverines to a Capital One Bowl victory over Florida. He was subsequently named as the game's MVP after throwing for over 350 yards. 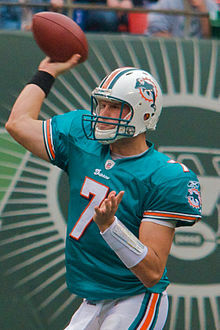 Henne's professional career began when he was drafted by the Miami Dolphins in the second round of the 2008 NFL Draft. Henne spent most of his rookie season on the bench, being the back-up to veteran quarterback Chad Pennington. In his second season with the Dolphins, Henne started the final 13 games of their 2009 season after Pennington was unable to play due to an injury. In 2000, five games into his freshman season at Wilson Senior High School in West Lawn, Pennsylvania, Henne stepped in for the injured starting quarterback. After putting up quality numbers, the Bulldogs coach decided to allow Henne to finish the season as the starter. Finishing the 2000 season on a high note, Henne ended up starting his sophomore year and ultimately the rest of his high school football career. At the end of his junior year in 2003, having been offered forty scholarships from various schools, Henne narrowed his college options down to five schools: Miami, Michigan, Georgia, Tennessee, and Penn State. Before his first game as a senior, Henne announced his plans to become a Wolverine at the University of Michigan. By the end of his senior year in 2004, Henne had thrown for a total of 7,071 passing yards, ranking third all time in Pennsylvania state history. Following high school, Henne played in the 2004 U.S. Army All-American Bowl as a member of the East team. In 2004, Henne entered the season as a freshman for the Wolverines, and third on the depth chart behind redshirt sophomore Matt Gutierrez and redshirt freshman quarterback Clayton Richard. The Monday prior to the season opener against the Miami RedHawks, Michigan head coach Lloyd Carr announced Gutierrez would start even though he was suffering from a sore shoulder. A few days later, Carr decided to allow Henne to start in relief of Gutierrez. Henne ended his first career game with a 43–10 win, completing 14 of 24 passes for 142 yards, two touchdowns, and one interception. Henne was just the second true freshman in Michigan history to start on opening day, a feat not seen at Michigan since Rick Leach in 1975. As a junior in 2006, Henne earned Rivals.com All-American third-team honors. He was a Manning Award finalist, Maxwell Award semifinalist, Davey O'Brien Award semifinalist, and Walter Camp Award candidate. The All-Big Ten Conference second-team choice started all thirteen games. He hit on 203-of-328 passes for 2,508 yards and 22 touchdowns with eight interceptions, ranking fifth in Michigan's season record list for touchdown passes, eighth in attempts and completions and tenth in passing yards. For the third straight year Michigan concluded their season by losing to Ohio State and then dropping their bowl game, this time to Southern California. During his senior year in 2007, Henne completed 162 of 278 passes for 1,938 yards, 17 touchdowns, and nine interceptions. The first game of the season ended in disaster for Michigan, a loss to Appalachian State that was considered one of the biggest sports upsets of all time. In the following game Henne suffered a knee injury in the first half against Oregon, and sat out the second half, as well as subsequent games against Notre Dame and Penn State, before returning to the starting lineup against Northwestern. In the final regular season game, Michigan fell to Ohio State 14–3, completing an 0–4 career record for Henne and fellow seniors Mike Hart and Jake Long against the Buckeyes. Henne played his final collegiate game against Florida in the Capital One Bowl. Henne was named the MVP of the game after he led his team to a 41–35 victory over the Gators and reigning Heisman Trophy winner, Tim Tebow. For his collegiate career, Henne completed 828 of 1,387 passes for 9,715 yards, 87 touchdowns, and 37 interceptions. All five marks are school records. Henne's passing touchdown total is second in Big Ten Conference history. Henne was drafted by the Miami Dolphins in the second round (57th overall) of the 2008 NFL Draft. He was the fourth quarterback chosen, following Matt Ryan, Joe Flacco, and Brian Brohm. His left tackle at Michigan, Jake Long, was the first selection of the draft and would again play alongside Henne in Miami. Henne agreed to a four-year, $3.5 million contract with the team on July 26. Out of training camp Henne earned the backup quarterback role behind starter Chad Pennington. During the second game of the 2008 season, Henne made his NFL debut with 9:42 left; down 31–3 against the Arizona Cardinals. Henne spent the remainder of the season on the bench and only played in two other games, both divisional matchups with the New England Patriots. During the third game of the 2009 season, in the early third quarter of a road game versus the San Diego Chargers, San Diego linebacker Kevin Burnett knocked Chad Pennington out of the game with a season-ending injury to his shoulder and rotator cuff. Henne came off the bench in relief. Though he led the Dolphins offense to ten points in the final 20 minutes of the game, he also had an interception returned 31 yards for an easy touchdown by Eric Weddle. Henne made his first career start on October 4, 2009 against Buffalo at home. Henne went 14–of–22 with one touchdown in a 38–10 victory, lifting the team to a 1–3 record. In his second NFL start, he led the underdog Dolphins to a 31–27 win over the New York Jets in a Monday Night Football game. He completed 20 out of 26 passes for 241 yards with two touchdowns. This was Henne's second straight win as starter and included a 53-yard touchdown pass to Ted Ginn, Jr.
Henne consistently improved as the season went on, passing for 335 yards against the New England Patriots in Week 13. In Week 15, Henne passed for 349 yards in a loss to the Tennessee Titans. In Week 16, Henne passed for 322 yards in a loss to the Houston Texans. In Week 17 against the Pittsburgh Steelers, Henne had gained 140 yards on 16–of–20 passing with one touchdown and interception, but had to leave the game with an eye injury. On November 10, 2010, after a 4–4 start to the 2010 season, Henne lost his starting job to Pennington. Pennington had led the Dolphins to an AFC East championship in 2008. On November 14, during the game against the Tennessee Titans, Henne came in relief for Pennington who went out with an apparent shoulder injury. During the third quarter, Henne himself was injured with an apparent knee injury and was replaced by Tyler Thigpen. Henne returned to action in Week 12 against the Oakland Raiders winning 33–17. In Week 13, Henne went back to his inconsistencies. He completed 16 of 32 passes and throwing 3 picks in a loss to the Browns. The following week, he went 5–of–18 for 53 yards and one touchdown in a 10–6 win against the New York Jets on an extremely rainy day. In week 15, he had a good game against the Buffalo Bills going 33–of–45 for 176 yards with a one touchdown and one interception. This came in a loss, which officially eliminated Miami from the playoffs. In Week 16, Henne faced the Detroit Lions and for three quarters looked sharp, however, questionable play calling in the fourth quarter led to a loss, and Henne went 29 of 44 for 278 yards with one touchdown and two interceptions. Henne had two opportunities in the fourth quarter to lead a game-winning drive and a game-tying drive, but poor play calling led to a loss. In the last week of the season against the New England Patriots, Henne went 6–16 for 71 yards with an interception. Henne finished the year with 3301 yards along with 15 touchdowns and 19 interceptions. His job as starter was thought to be in question during the off season when it was rumored that the Dolphins sought to acquire Kyle Orton from the Denver Broncos. Coupled with the acquisition of Carolina Panthers quarterback Matt Moore and rookie draft pick Pat Devlin, it was unclear if Miami would continue its commitment with Henne. The Orton rumor eventually fizzled and Devlin was waived and signed to the practice squad, leaving Moore and Henne as the two quarterbacks on the active roster. It would later be announced that Henne would have the starting job in 2011. Henne's 2011 starting campaign began well, throwing for 416 yards and a professional career best passer rating of 93.6. These improvements were overshadowed by Tom Brady's 517 pass yards and the resulting loss to the New England Patriots. It was the seventh game of all time to have two quarterbacks surpass 400+ yards. On Sunday October 2, 2011, in a game against the San Diego Chargers, Henne hurt his left shoulder at the end of a run on a broken play on the Dolphins' second possession and did not return. His injury was later revealed to be a dislocated shoulder in his left (non-throwing) arm. Slated to undergo surgery, Henne was placed on injured reserve and missed the remainder of the 2011 season. The Miami Dolphins announced on February 21, 2012 that they would not re-sign Henne, making him a free agent. Henne signed a two-year deal with the Jacksonville Jaguars on March 14, 2012. In the Jaguars Week 11 game against the Texans, Henne came in for an injured Blaine Gabbert and threw for over 300 yards and 4 touchdowns. Henne and Steve Young are the only two players in NFL history since the merger to not start the beginning of a game and throw 4 touchdowns without an interception. He started the final six games of the season for the team after an injury to Gabbert. After quarterback Blaine Gabbert was benched midway through the 2013 season, Henne became the starter for the rest of the season, starting a total of thirteen games. The Jaguars would go on to finish the season with a 4–12 record. On March 7, 2014, Henne signed a two-year, $8 million extension for $4.5 million guaranteed with the Jaguars. Following a disappointing first half in the 2014 home opener in Week 3, Henne was benched in favor of rookie first-round draft pick Blake Bortles. Bortles remained the starter for the rest of the season, leaving Henne as the backup. In 2015, Henne remained the backup for Bortles. He did not see any action in the 2015 season. Henne signed another two-year, $8 million contract extension on February 18, 2016 to remain as the backup to Bortles. On February 15, 2017, the Jaguars restructured Henne's contract. On March 16, 2018, Henne signed a two-year contract with the Kansas City Chiefs. In the 2018 season, Henne was the backup to Patrick Mahomes. He appeared in one game in the 2018 season, Week 17 against the Oakland Raiders. Henne was born in Reading, Pennsylvania, to Sheldon and Suzanne Henne. On July 5, 2010, Henne married Brittany Hartman. ^ Game Recap. Retrieved July 28, 2010. ^ Salazar, María (January 22, 2018). "Football excitement reaches fever pitch in Berks". WFMZ. Retrieved January 29, 2018. ^ "U.S. Army All-American Bowl Alumni". Usarmyallamericanbowl.com. Archived from the original on December 16, 2010. Retrieved December 28, 2010. ^ "Miami (OH) at Michigan Box Score, September 4, 2004". College Football at Sports-Reference.com. Retrieved January 29, 2018. ^ "Michigan State at Michigan Box Score, October 30, 2004". College Football at Sports-Reference.com. Retrieved January 29, 2018. ^ "Rose Bowl – Texas vs Michigan Box Score, January 1, 2005". College Football at Sports-Reference.com. Retrieved January 29, 2018. ^ "2005 Michigan Wolverines Schedule and Results". College Football at Sports-Reference.com. Retrieved January 29, 2018. ^ "Notre Dame at Michigan Box Score, September 10, 2005". College Football at Sports-Reference.com. Retrieved January 29, 2018. ^ "Chad Henne 2005 Game Log". College Football at Sports-Reference.com. Retrieved January 29, 2018. ^ "Chad Henne 2006 Game Log". College Football at Sports-Reference.com. Retrieved January 29, 2018. ^ "Rose Bowl – Michigan at Southern California Box Score, January 1, 2007". College Football at Sports-Reference.com. Retrieved January 29, 2018. ^ "Chad Henne 2007 Game Log". College Football at Sports-Reference.com. Retrieved January 29, 2018. ^ "Appalachian State at Michigan Box Score, September 1, 2007". College Football at Sports-Reference.com. Retrieved January 29, 2018. ^ "Oregon at Michigan Box Score, September 8, 2007". College Football at Sports-Reference.com. Retrieved January 29, 2018. ^ "Michigan at Northwestern Box Score, September 29, 2007". College Football at Sports-Reference.com. Retrieved January 29, 2018. ^ "Ohio State at Michigan Box Score, November 17, 2007". College Football at Sports-Reference.com. Retrieved January 29, 2018. ^ "Capital One Bowl – Michigan vs Florida Box Score, January 1, 2008". College Football at Sports-Reference.com. Retrieved January 29, 2018. ^ "Chad Henne". nfldraftscout.com. Retrieved September 2, 2016. ^ "2008 NFL Draft Listing". Pro-Football-Reference.com. Retrieved January 29, 2018. ^ Heuser, John (April 26, 2008). "Henne joins Long in Miami draft class". Michigan Live. Retrieved December 28, 2010. ^ "Miami Dolphins at Arizona Cardinals – September 14th, 2008". Pro-Football-Reference.com. Retrieved January 29, 2018. ^ "Chad Henne 2008 Game Log". Pro-Football-Reference.com. Retrieved January 29, 2018. ^ "Miami Dolphins at San Diego Chargers – September 27th, 2009". Pro-Football-Reference.com. Retrieved January 29, 2018. ^ "Buffalo Bills at Miami Dolphins – October 4th, 2009". Pro-Football-Reference.com. Retrieved January 29, 2018. ^ "New York Jets at Miami Dolphins – October 12th, 2009". Pro-Football-Reference.com. Retrieved January 29, 2018. ^ "New England Patriots at Miami Dolphins – December 6th, 2009". Pro-Football-Reference.com. Retrieved January 29, 2018. ^ "Miami Dolphins at Tennessee Titans – December 20th, 2009". Pro-Football-Reference.com. Retrieved January 29, 2018. ^ "Houston Texans at Miami Dolphins – December 27th, 2009". Pro-Football-Reference.com. Retrieved January 29, 2018. ^ "Pittsburgh Steelers at Miami Dolphins – January 3rd, 2010". Pro-Football-Reference.com. Retrieved January 29, 2018. ^ "2010 Miami Dolphins Statistics & Players". Pro-Football-Reference.com. Retrieved January 29, 2018. ^ "Tennessee Titans at Miami Dolphins – November 14th, 2010". Pro-Football-Reference.com. Retrieved January 29, 2018. ^ Craig Barnes sports@knoxews.com. "Shoulder injury knocks Pennington out". Knoxville News Sentinel. Retrieved December 28, 2010. ^ "Miami Dolphins at Oakland Raiders – November 28th, 2010". Pro-Football-Reference.com. Retrieved January 29, 2018. ^ "Cleveland Browns at Miami Dolphins – December 5th, 2010". Pro-Football-Reference.com. Retrieved January 29, 2018. ^ "Miami Dolphins at New York Jets – December 12th, 2010". Pro-Football-Reference.com. Retrieved January 29, 2018. ^ "Buffalo Bills at Miami Dolphins – December 19th, 2010". Pro-Football-Reference.com. Retrieved January 29, 2018. ^ "Detroit Lions at Miami Dolphins – December 26th, 2010". Pro-Football-Reference.com. Retrieved January 29, 2018. ^ "Miami Dolphins at New England Patriots – January 2nd, 2011". Pro-Football-Reference.com. Retrieved January 29, 2018. ^ "Chad Henne 2010 Game Log". Pro-Football-Reference.com. Retrieved January 29, 2018. ^ "New England Patriots at Miami Dolphins – September 12th, 2011". Pro-Football-Reference.com. Retrieved January 29, 2018. ^ "Miami Dolphins at San Diego Chargers – October 2nd, 2011". Pro-Football-Reference.com. Retrieved January 29, 2018. ^ "Dolphins to Cut Henne Loose: Report". ^ Silva, Evan (March 15, 2012). "Jaguars sign Chad Henne to push Blaine Gabbert". ^ "Jacksonville Jaguars at Houston Texans – November 18th, 2012". Pro-Football-Reference.com. Retrieved January 29, 2018. ^ "Chad Henne 2012 Game Log". Pro-Football-Reference.com. Retrieved January 29, 2018. ^ "2013 Jacksonville Jaguars Statistics & Players". Pro-Football-Reference.com. Retrieved January 29, 2018. ^ DiRocco, Michael (March 7, 2014). "Chad Henne agrees to 2-year deal". ESPN.com. Retrieved May 15, 2014. ^ "Chad Henne 2014 Game Log". Pro-Football-Reference.com. Retrieved January 29, 2018. ^ Hanzus, Dan (February 18, 2016). "Chad Henne signs two-year, $8M contract with Jaguars". NFL.com. Retrieved February 18, 2016. 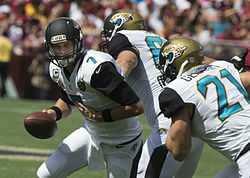 ^ "Jaguars & QB Chad Henne Agree To Restructured Deal – NFLTradeRumors.co". nfltraderumors.co. Retrieved February 15, 2017. ^ Sessler, Marc (March 16, 2018). "Chiefs sign Chad Henne to back up Patrick Mahomes". NFL.com. ^ "Chiefs sign veteran QB Henne to back up Mahomes". USA TODAY. Retrieved January 24, 2019. ^ "Oakland Raiders at Kansas City Chiefs – December 30th, 2018". Pro-Football-Reference.com. Retrieved January 24, 2019. This page was last edited on 10 April 2019, at 19:29 (UTC).